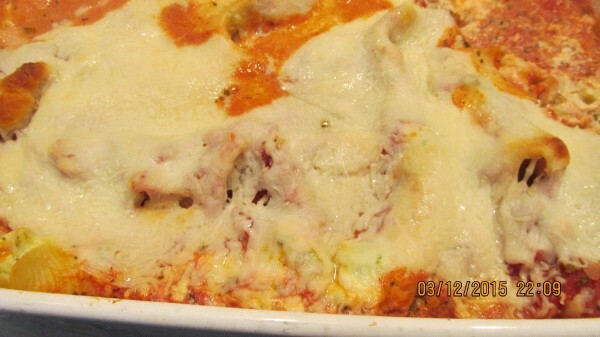 A wonderful cheesy main dish that is easy to prepare and loved by the whole family. This page contains broccoli stuffed pasta shells recipe. This is a delicious main dish that is easy and quick to prepare. It is my own recipe from years ago. My kids really loved these! I hope you do too. Cook shells, drain, cool off and lay them out on a cookie sheet so they don't stick together. In a large mixing bowl, combine ricotta, 8 oz. mozzarella, Parmesan cheese, eggs, parsley, black pepper, 1/2 teaspoon salt, and broccoli. Mix all very well. Open stewed tomatoes, put them in a mixer or blender, only process for a few seconds. It will be chunky. Pour into a mixing bowl, add to this, basil, salt, pepper, Italian seasoning, and sugar. Mix well and keep this cold. No need to cook or heat this up. Use a 9x13 deep, glass, oven proof dish. Put a two ladles of tomatoes in the bottom first. Then one by one fill each shell with the broccoli and cheese mixture, and place them very close together in the dish. Continue until all the cheese is used. Pour all the tomatoes over the shells. Top with 8 oz. of mozzeralla cheese. Bake at 350 degrees F for about 45 minutes or until everything is bubbly. Test it with a butter knife in the middle to feel the temperature. Enjoy! You may sprinkle additional Parmesan cheese on when serving.